By Jeff Barnard, Associated Press Writer. I know this is not really an Aquarium or Pond related story, however since it involves the local ocean waters of Oregon and I find this interesting, I thought I would post this. “GRANTS PASS, Ore. — Scientists listening to underwater microphones have detected an unusual swarm of earthquakes off central Oregon, something that often happens before a volcanic eruption — except there are no volcanoes in the area. Scientists don't know exactly what the earthquakes mean, but they could be the result of molten rock rumbling away from the recognized earthquake faults off Oregon, said Robert Dziak, a geophysicist for the National Oceanic and Atmospheric Administration and Oregon State University. There have been more than 600 quakes over the past 10 days in a basin 150 miles southwest of Newport. The biggest was magnitude 5.4, and two others were more than magnitude 5.0, OSU reported. On the hydrophones, the quakes sound like low thunder and are unlike anything scientists have heard in 17 years of listening, Dziak said. Some of the quakes have also been detected by earthquake instruments on land. The hydrophones are left over from a network the Navy used to listen for submarines during the Cold War. 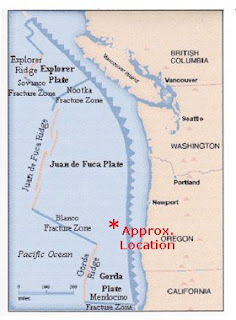 They routinely detect passing ships, earthquakes on the ocean bottom and whales calling to one another. Scientists hope to send out an OSU research ship to take water samples, looking for evidence that sediment has been stirred up and chemicals that would indicate magma is moving up through the Juan de Fuca Plate, Dziak said. The quakes have not followed the typical pattern of a major shock followed by a series of diminishing aftershocks, and few have been strong enough to be felt on shore. The Earth's crust is made up of plates that rest on molten rock, which are rubbing together. When the molten rock, or magma, erupts through the crust, it creates volcanoes. That can happen in the middle of a plate. When the plates lurch against each other, they create earthquakes along the edges.